Kendall Mills This image is circa 1910. 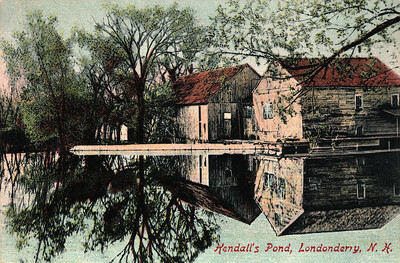 Located in South Londonderry, Kendall Pond was the site of a thriving mill business. In 1731, the rights were granted to Benjamin Wilson to build the mill. There was a large farm on the property, along with a barn across the road, and a separate building to store and age cider. In 1866, 700 barrels of cider were made at the mill. It has also been called Goss's, Moor's and Kendall's Mills. 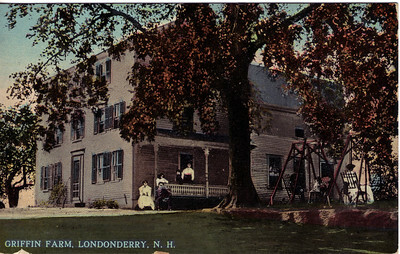 In the late 1800's and early 1900's, the pond furnished most of the ice in Londonderry for home iceboxes and milk coolers. In October of 1924, the mill buildings and barn burned down. 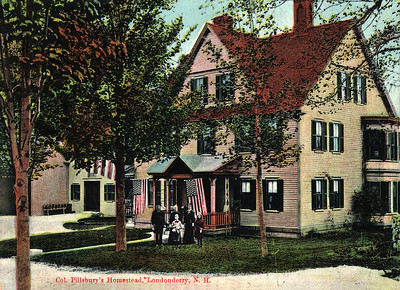 Hardy House This picture is circa 1910. Aaron P. Hardy, the son of Daniel and Sarah Hardy, owned the home. Aaron learned to make shoes at young age and by the age of 21, in 1836, he had made $400. He later used that money to buy land and his holdings soon grew from 35 acres to 800. He married Delia W. Brickett who helped support the family by making braided hats and selling them for 7 cents each. In addition to making shoes and farming, he also owned two retail stores: Hardy & Pillsbury and A.P. Hardy and Son. 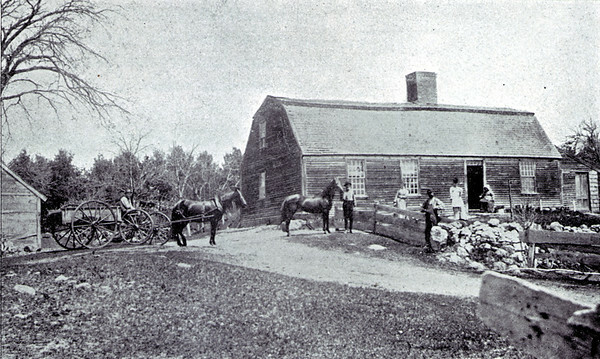 Griffin Farm In 1898, Frank Griffin and his wife Margaret moved to Londonderry and bought the farmstead on Griffin Avenue (then known as Breakneck Hill). 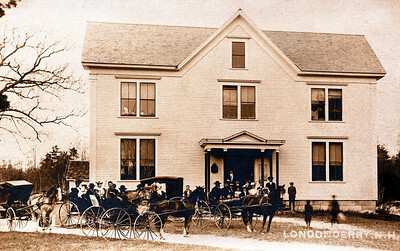 Originally, the house was a two-story Colonial, but the Griffins remodeled it into the three-story pictured. The couple had 10 children. 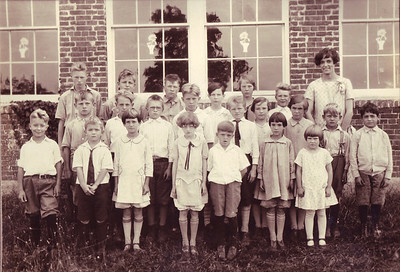 School House #4 This image is circa 1927. Located on the corner of Parmenter Road and High Range Road, the school house was built in 1850. 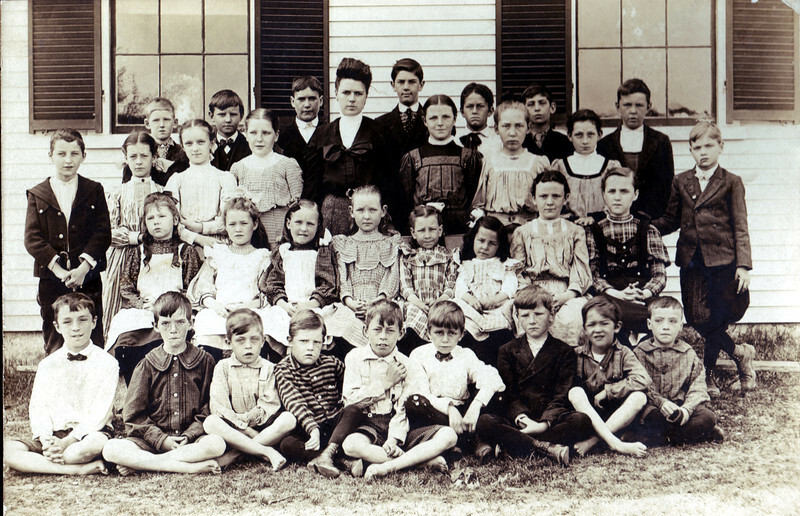 Grades 1 through eight attended the school, which is now a private residence. 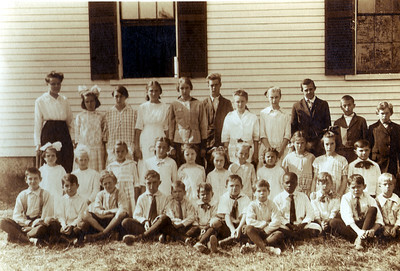 Pictured include: Roy Holton (back row, far left); Ed Misiaszek (back row, second from left); Loiuse Holton (back row, third from right); Miss Call (teacher, back row, far right); Fred Misiaszek (second row, far left); Quinton Elwood (second row, fifth from right); Patsy (boarder, second row, far right); John Ralston (front row, second from left); Amy Elwood (front row, center); and Rae Parmenter (front row, far right). School House #1 This picture is circa 1899. School House number 1 was dedicated in 1851 and stands on the corner of Hardy and Pillsbury Roads. It was once part of the Hardy Homestead. It still stands today but is now a private residence. Pillsbury Homestead The Pillsbury Homestead belonged to Colonel William S. Pillsbury. Colonel Pillsbury was born on March 16, 1833 and began a career as a shoemaker at the age of 14. By age 20, he was superintendent of the shoe factory. Eventually, he owned his own business in Londonderry and Derry Depot. He was a dedicated Union Soldier during the Civil War. After the war, he married Martha Silver Crowell on April 15, 1865, and together they had 4 children: Rosecrans, Charles, Harriet and Ulysses. He also held a number of public offices at state and local levels. 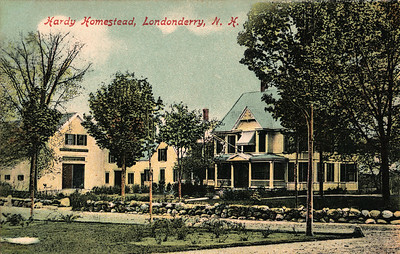 The homestead is still located on Pillsbury Road in Londonderry. School House #8 This picture is circa 1918. Located on Bartley Hill Road, this schoolhouse replaced the old 25-foot by 17-foot red schoolhouse that was built in 1794. The newer building was finished in 1858 and the belfry was added 1912. The building burned down in 1931 but was replaced in 1932. It also served multiple purposes to the community, providing a place to host events like singing school, spelling competitions, and religious revivals. School House #7 This image is circa 1906. This school house is located on Grenier Field Road (originally called Goffe's Falls Road), located near White's Tavern. It served eight grades of grammar school scholars in North Londonderry. Girls entered and exited through the left door of the school and boys used the right door. There was probably only one teacher for a large number of students. It still stands today, but is now a private residence. Ocean Born Mary's House The house was named after Mary Wilson, the daughter of James and Elizabeth Wilson. Stories say she was born on a sailing ship and named by a pirate captain during the emigration of Scottish families from Londonderry, Ireland in 1720. There are different accounts of how the story actually went; one claimed she was born when pirates boarded the ship and ordered everyone to appear on deck. Upon exploring, the pirate captain discovered both mother and baby in a cabin and asked if the baby was yet named. He said that, if he could name her, he would leave everyone on the ship unharmed, and so she was given the name Mary. All accounts claim that the pirate captain left a bolt of green silk brocade with a floral pattern to be made into wedding gown when Mary married. James Wilson died shortly after reaching the New World and Elizabeth remarried James Clark. The family lived in the house, built before 1730 of hand-hewn timbers cut from the site, at the corner of Auburn and Wilson Roads. In 1930, it was dismantled piece by piece, each piece was numbered, and moved to Little Compton, Rhode Island. There, is was reassembled and is now known as "Sea-Born Mary's House". Town Hall/Lions Club The original Town Hall was built in 1770's near the corner of Pillsbury and Hardy Roads. It was originally used as Reverend William Morrison's meetinghouse and was moved to its current location on Mammoth Road after the Presbyterian Church was built in 1837. The building was enlarged and hosted social functions. In 1956, all town offices were located here, but by 1967, the town offices were moved to what is now Matthew Thornton School. In 1972, the Lion's Club began leasing the building and has since. This image is circa 1906. 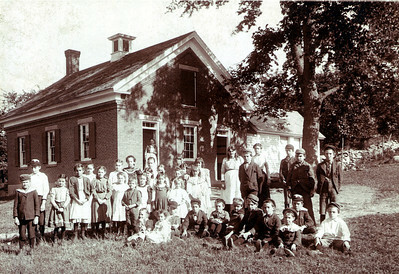 This school house is located on Grenier Field Road (originally called Goffe's Falls Road), located near White's Tavern. It served eight grades of grammar school scholars in North Londonderry. Girls entered and exited through the left door of the school and boys used the right door. There was probably only one teacher for a large number of students. It still stands today, but is now a private residence.